Opi and Essie are both awesome salon brand nail polishes that are sold in drugstores as well as beauty supply stores. There are differences between Opi and Essie nail polishes which can make a difference in which one you choose. Brushes- Opi polishes have a wide thick brush that can make it easier or harder to paint your nails depending on their shape. If you have small nails the brush of this brand will probably not work well for you – if you are painting your nails yourself. Small nails require smaller brushes for easier application. Of course if your nails are being painted by a professional it should be a smoother application overall. Bigger or regular nails are perfect for Opi brushes. Collections- Opi releases a fall/winter collection usually in the beginning of the fall, and a spring/summer collection towards the end of winter. Their collections are released with the two of the four seasons grouped together, therefore there are 2 major collections a year which are always sold in stores. They also release specialized collections focused on a theme such as a celebrity or a movie like the Skyfall or Mariah Carey collections throughout the year. The specialized collections are harder to find in drugstores but are readily available online and in beauty supply stores. Color Selection- As a whole Opi releases more unique shades with a better color payoff. Examples include “Stranger Tides”, “Im IndiaMood for Love” and “GoldenEye”. Essies brushes are shorter and smaller which will work wonders for all nails. Essie’s brush alone is why this brand is a universal tool for all types of nails. Collections- Essie releases their seasonal collections separately. Consumers see individual collections for each season, as well as “Resort” and “Breast Cancer” collections . 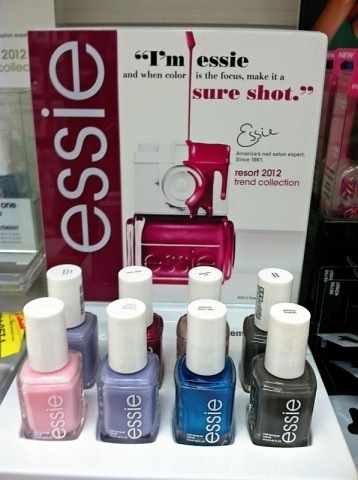 all Essie’s collections are always available in drugstore making them much more readily available then Opi.